Dark Nights: Metal saw the DC Universe invaded by a collection of alternate evil Batmen from the Dark Multiverse, each one a reflection of some of Bruce Wayne’s deepest fears. The collected edition of Metal didn’t really go into each of these Batmen and why they were so fearsome, leaving that aspect of the story something to be desired. Dark Nights: Metal – Dark Knights Rising is a companion book to the main story that delves into the backstories of these Nightmare Batmen and how they came to be. Featuring a roster of all-star writers and artists, the book is a entertaining and intriguing collection that sheds light on the group’s motivations and what makes them so dangerous, even if it gets somewhat repetitive throughout the various stories. The stories focus on the evil Batmen from the Dark Multiverse that are a combination of Batman and another hero from the Justice League or, in some cases, a villain. There’s The Red Death (Flash), The Murder Machine (Cyborg), Dawnbreaker (Green Lantern), The Drowned (Aquaman from a gender-swapped universe), The Merciless (Wonder Woman), The Devastator (Doomsday) and the Batman Who Laughs (The Joker). Each one feels distinct enough from the other in their stories, though some are more interesting than others and a couple of those stories fall a little flat in their execution. The most interesting of the Batmen are The Drowned, Dawnbreaker, The Merciless and the Batman Who Laughs. Dawnbreaker is notable because Bruce Wayne is a teenager who hasn’t moved past his grief and anger, gaining the Green Lantern ring moments after his parents death and overriding it to commit acts of murder and terror against Gotham’s criminals. Its a good chapter that focuses a bit on the despair Bruce felt and what might have happened to him had he allowed himself to remain trapped in that state. Out of all the Batmen, he may be the most tragic in a sense. The Merciless is a Batman who defeated Ares and became the new God of War, taking his strategic mind to the next level by waging an actual war against evil while losing sight of how the power corrupted him. The Drowned, though, is a Batwoman from a gender-swapped world named Bryce Wayne who experimented on herself to gain Atlantean powers in order to fight the invading Aquawoman. The concept around her is very interesting and her chapter is one of the best ones because of its art, story and character. It’s just a shame we don’t see more of her in Metal proper and may never see her again. The real hook of the story, though, is the Batman Who Laughs, the group’s mysterious and sadistic ringleader bent on the destruction of the multiverse mostly because it seems like a fun idea. This Batman was created after The Joker pushed him one step too far and finally got Batman to kill him. However, he engineering his death to release a toxin that would turn Batman into a near copy of The Joker, but still keeping Batman’s higher faculties. It’s his final victory against the Dark Knight and his chapter is incredibly dark as he casually murders the Bat-family and Justice League, coming around to Joker’s perspective on life and heroism. It’s easy to see why Scott Snyder devotes so much time to him in Metal as he’s a very captivating and frightening character. Where some of the story’s show their weakness is in the repetitive nature of them. 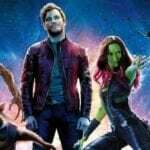 They each follow the same basic pattern of flashing back to time on their Earth on what drove them to taking things too far and attacking their Justice League colleagues. Some either take place during Metal where he see events lightly tie-in to the main story as they flash back to their origins. It gets a little tiresome to read the same structure over and over again, but some of the writers manage to make their chapters feel fresh and entertaining despite the similar stories. Sam Humphries, Dan Abnett, Peter Tomasi and James Tynion IV write the chapters for Dawnbreaker, Drowned, Mercliess and Laughs respectively and find interesting aspects of each Batmen to focus on and explore that elevate their stories. 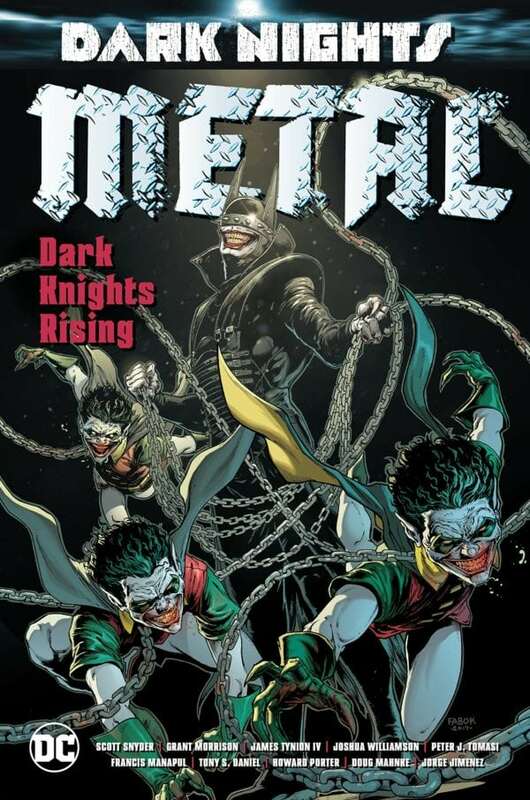 The book also includes Dark Knights Rising – The Wild Hunt, a one-shot issue that takes place towards the end of Metal as the Dark Knights are on the cusp of victory. It’s actually an essential chapter to Metal that shows what some of the other heroes have been doing to combat the invasion and where they get the extra help from in Metal‘s finale. Its placement here is a bit interesting and could be confusing to some who haven’t read Metal in full. There are two good aspects to this story however that still make it entertaining to read: its the only story in the book where we see all the Dark Knights interact with other and learn there are some uneasy alliances among them and Scott Snyder has help writing the issue from none other than Grant Morrison. It makes sense for Morrison to co-write an issue of the Metal saga since Snyder builds off so much of his previous work from Final Crisis, his Batman run and even Multiplicity. Its a crazy issue with a lot going on, but Snyder and Morrison do well giving each of the evil Batmen their own presence and chemistry while Detective Chimp, of all the wacky characters in the DC Universe, gets a pretty good spotlight on his own here and becomes an integral piece to Metal‘s conclusion. The art throughout the book is well done with a lot of DC’s big talent contributing to the issues. Artists such as Francis Manapul, Tony Daniel, Ethan Van Sciver, Riley Rossmo, Howard Porter, Doug Mahnke and Jorge Jimenez make each of the Dark Knights look great and terrifying in their own way with a lot of detail. It is definitely some of the best art we’ve gotten in tie-in issues to a big event. Dark Nights: Metal – Dark Knights Rising is a good book that highlights the evil Batmen very well. The only flaw is the repetitiveness of the stories, but each writer still manages to find something intriguing to tap into, though some stories stand out better than most. The art is well done throughout the issues and they expand on the danger facing the universe rather well. Fans of Metal and ‘what if?’ style tales should enjoy this book.